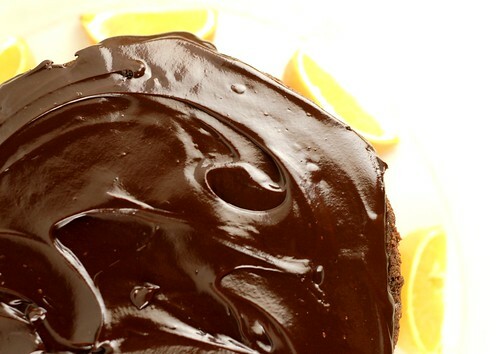 You will never know how good it felt to bake this cake... to stand there calmly stirring the batter, layering the cake, pouring that luscious chocolate glaze on top and watching it drip down the sides. It was food for my soul, really. Especially after 3 long weeks of going out to eat, traveling all over the place and hardly stepping in my kitchen at all except to get some water to drink or pour a bowl of cereal. This is my own little "welcome back" celebration. And I picked a pretty awesome cake to celebrate with. I am three weeks into my new job and loving it. I am back from Arkansas. Michael and I are way ahead in our wedding planning. Everything seems to be settling down nicely. Thank you guys for hanging in here with me. Reason #854 why you are awesome. Now on to what you are really here for: the food. This beauty is a light chocolate cake with a fluffy orange filling and rich chocolate ganache poured on top. Oh yes. This is an old fashioned cake recipe too, the kind that uses boiling water and cocoa powder to make a paste, which is mixed into the batter. Can't go wrong with that. I chopped up about 8 total ounces of chocolate and almost a full cup of cocoa powder for this cake. So - it is chocolatey, people. In the best way possible. Raise your hand if you love fruit and chocolate! Love love love. 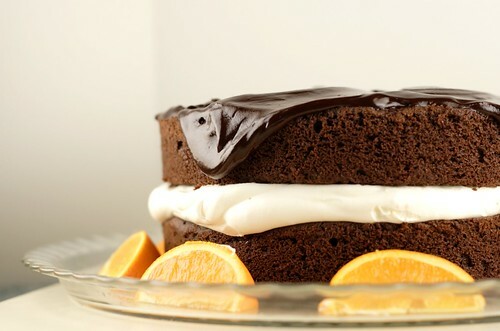 I really love the bright citrus flavor that bursts out with this filling combined with rich chocolate cake. And the filling couldn't be easier - it's just cool whip mixed with orange zest and juice. So fresh and delicious. And of course the best part is the thick chocolate glaze on top. It adds this crazy richness to the cake and makes it look beautiful... totally irresistible. You know you want to stick your finger (or face) through this screen! I understand. I missed you guys. Can't wait to reconnect! Preheat oven to 350 degrees. To prepare cake, combine 1 cup boiling water and 2/3 cup cocoa powder in a bowl, stirring until smooth. 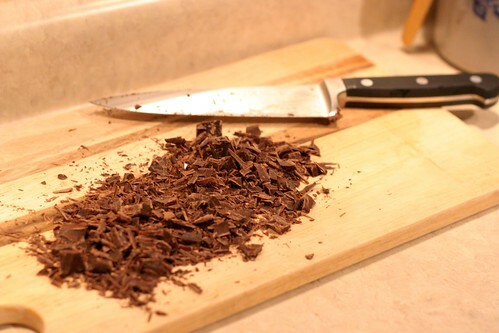 Add 2 ounces chocolate; stir until smooth. Set aside to cool to room temperature. Meanwhile, coat 2 8-inch round cake pans with baking spray or butter. Place 1 3/4 cups sugar, 6 tablespoons butter and 1 teaspoon vanilla in a large bowl. Beat with a mixer at medium speed 1 minutes. Add egg whites, one at a time, beating well after each addition. Add sour cream; beat at medium speed 2 minutes, egg whites should become slightly fluffy. In a separate bowl, combine flour, cornstarch, baking powder, baking soda and salt. Stir to mix. Add flour mixture and cocoa mixture alternatively to sugar mixture, beginning and ending with flour mixture and beating until just combined. Divide batter evenly between the 2 prepared pans. Bake at 350 degrees for 25 minutes or until a wooden toothpick comes out with just a few crumbs. Cool in pans 10 minutes, then place on wire racks to cool completely. 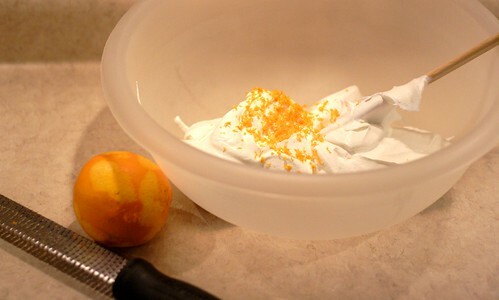 To make filling, combine cool whip, orange zest and juice in a bowl. Set aside to assemble cake. To make the chocolate glaze, combine evaporated milk, 1 tablespoon butter and 4 ounces chocolate in a microwave safe bowl. Microwave for 1 minute, stirring every 15 to 20 seconds until smooth. 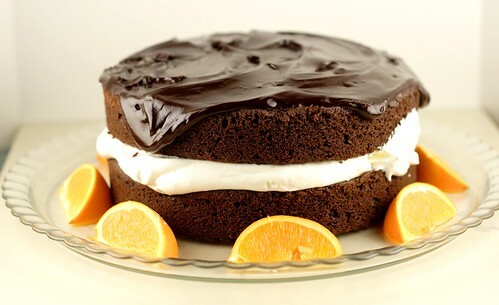 Place cake layer on a plate and top with orange filling. Place the other cake on top and spoon chocolate glaze on top, until it's just falling over the edges. So glad you had a chance to cook again! This cake looks just gorgeous. And it's from Cooking Light? Bonus. I won't feel so guilty when I make one and eat the whole thing. JENNA! I missed you're posts!!! So glad you're back and doing well :) Oh, and that cake looks amaaaaazing. I love fruit and chocolate, but orange/choco is by far my fave of all. This is an amazing cake. Gorgeous. Love your blog! Hi Jenna, remember me? 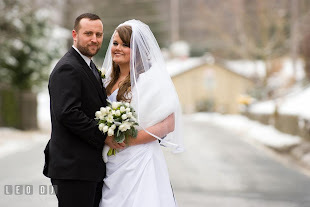 I sublet my room to you in Weehawken, NJ when I got married. Anyway, I love your blog! Everything about it is great--the life stories, the food & recipes, the lighting and setup details--so cute! When I saw this cake, I HAD to try it! I made it yesterday. It was so much fun, and the taste is amazing! I've never made anything like it before. So, this is kind of silly, but I don't know if I was too hasty, or if the orange filling should have been refrigerated before being topped on the bottom cake layer, or if the cake should have been chilled before serving, but when I cut into the cake after having waited 20 minutes or so most of the filling gushed out, lol. So afterwards my brain went "Oh, cool whip...probably shouldn't be out of the fridge too long..." lol. What do you suggest doing? Thanks Jenna, have a great weekend! I look forward to more blog posts! I loooove this cake... but you're right, it's pretty messy to slice and eat! When I served it on Easter, it had been in the fridge for 4-5 hours and then sat out at room temperature for 30 minutes or so before serving. That seemed to work pretty well. I probably should have suggested refrigerating the cake in the recipe. That might help with the oozing! So no, you didn't do anything wrong and I'm glad you brought this up! Also - it might help to use a sharp, serrated knife when cutting this cake. Just let the knife do the work by sawing it back and forth gently. That way it slices through easier and you don't have to push and smoosh the top layer so all the filling comes out the sides. Does that make sense? Homemade angel food cake is time consuming and tricky (the egg whites can be temperamental!) but it's SO worth it. 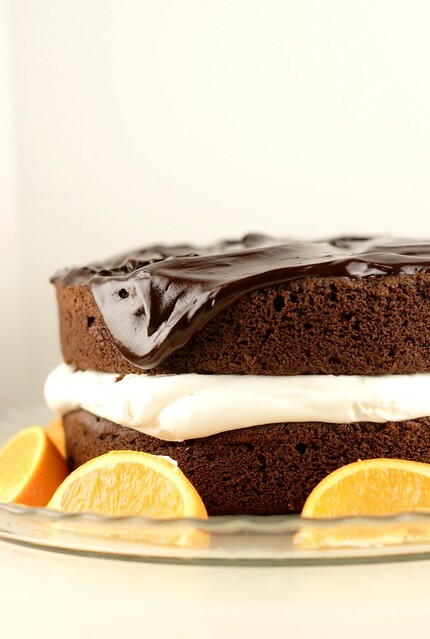 My daughter requested a chocolate cake with cream and orange for her birthday and I found this recipe on the web. Fantastic cake! Just what the birthday girl ordered. This will become a family classic. DO YOU LIKE Costa Rica IT IS A GREAT SITE.